A short review for a short book. I just love Cass' writing. In the second book of The Selection Series, we get to know America's true personality a little more. She becomes a strong and courageous woman who is not afraid to fight for what she believes in. She changes from a quiet stubborn girl to a girl who might be able to stand beside the ruler of the country one day. 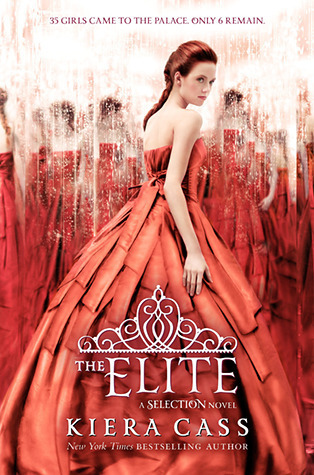 The Elite holds a little more drama than the last book, as America becomes forced to make a choice between her first love and a possible new love. Who will she choose? As much as I enjoyed The Elite, it became slightly repetitive at times. I thought I might have a panic attack if she didn't just make choice and end the book. But for all good things a person must wait. All in all, I thoroughly enjoyed The Elite and look forward to reading more of Cass' writing. I would recommend this to lovers of simple YA fiction. It is a very quick and easy read.